Last week we had a special day with our 5 year old grandson Callum. We rarely get him alone, without his big brother and sister, or slightly older cousin. But we missed the last Grandparents Day at his preschool because of our trip to Venice, so we took him to the American Museum of Natural History. He wanted to go to see Creatures of Light (bioluminescense exhibit) and I wanted to see the Imax film "Born to Be Wild." 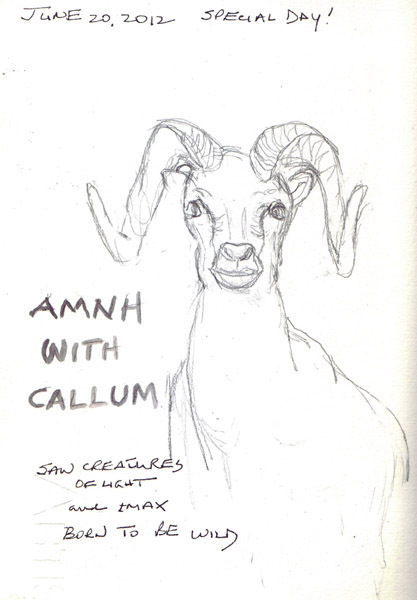 While walking between the two, I stopped for an incredibly fast sketch of a mountain sheep. I left it in graphite as a reminder of how quickly this was sketched (i.e <5minutes). 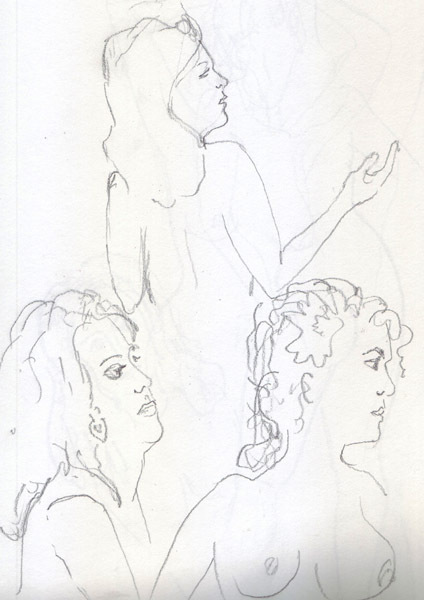 Last evening I didn't feel like sketching, but wanted to push myself. I opened my Reference Photo folder on the computer and selected this photo (taken on a street in Chelsea New York in April). I rarely paint with watercolor, without drawing in ink, so this became a practice sketchbook page. I have no idea what they were looking at and photographing. 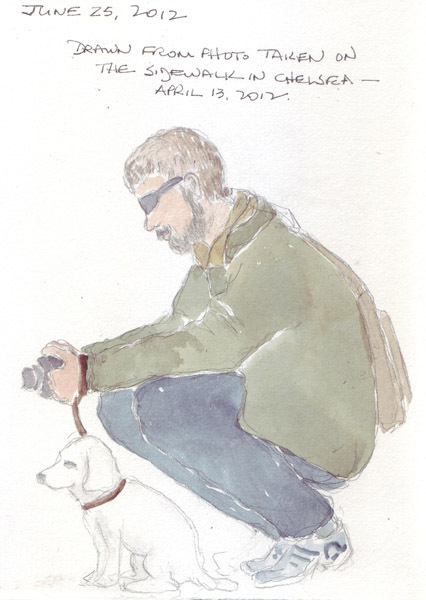 I was concentrating just on the man and his dog long enough to get this photo. I spent today with my Mother in her retirement complex in New Jersey. We take long walks and usually stop for coffee. 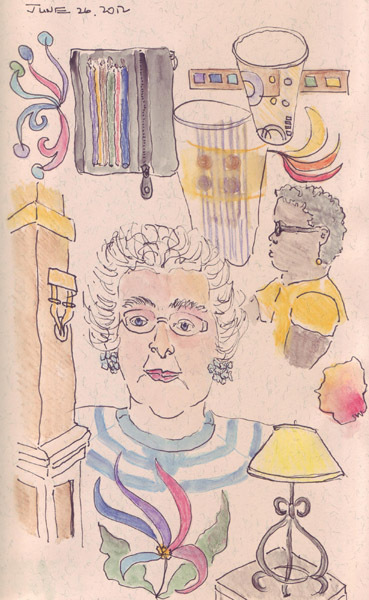 While sitting and talking, I doodle, drawing with ink and painting with watercolor pencils. Today she thought that the lady looked a little like her. Usually she tells me why my sketches are NOT her. I save strips of watercolor paper when I am making watercolor sketchbooks. It was so much fun to sketch Klimt designs when I was in Venice, that I decided to make myself a new magnetic bookmark with gold gouache and gold pen. I love the metallic glitter, even though it can't be seen in a scan. If you have never used a magnetic bookmark, they are fabulous because after you fold them over a single page, they never move. I'm not an e-book reader, so these remain my favorite bookmarks. The folded size is 5.5" by 2.5 "
I use Staples adhesive magnets made for the back of business cards - and cut them in half horizontally. I then adhere each half to one side of the folded strip of paper - at the bottom of each side. Here are 3 more bookmarks that I made from painted strips during the last year. 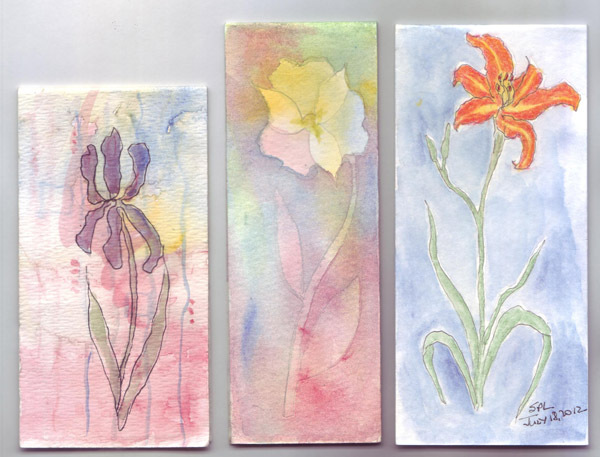 The day lily is 5.5 x 2.5" and the other two slightly smaller. This is another bookmark that I made when I needed to make small gifts. 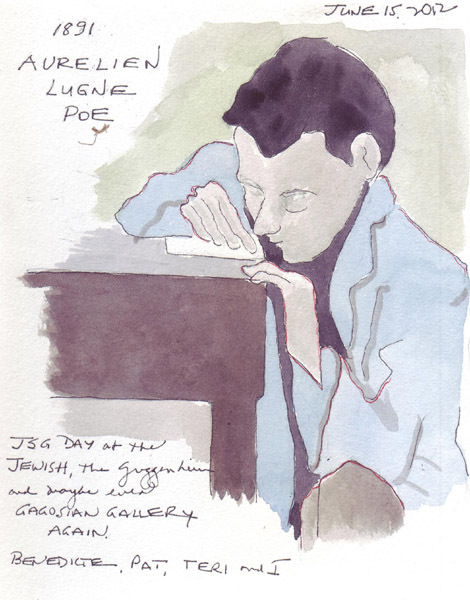 This was a sketchbook painting that I made from the German Expressionism exhibit at the Museum of Modern Art. Then I sized it, made multiple copies of it in Photoshop, and printed 5-6 of them on the same page of cardstock. Here is my earlier blog post about making magnetic bookmarks. 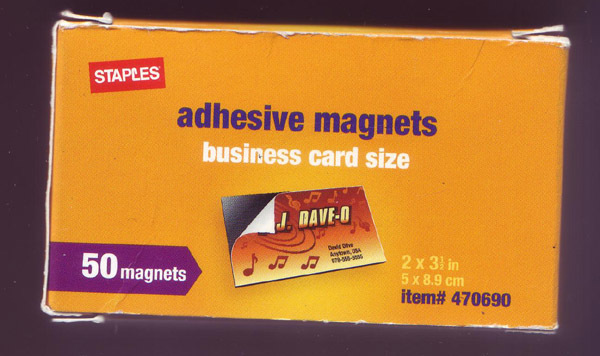 Back then I was using magnetic strips purchased in craft stores. After a month of traveling, it was wonderful to see my art friends Pat, Teri, and Benedicte. Pat and Benedicte planned the day and Teri and I joined in at the last minute. Although I previously saw the Edouard Vuillard exhibit at the Jewish Museum, I loved going again so I could sketch another one of his paintings. There was a group touring the exhibit, so I was also able to listen to the commentary by the guide and learn more about the life of Vuillard. After a leisurely lunch between the two museums, we went to the new exhibit at the Guggenheim: Art of Another Kind - International Abstraction and the Guggenheim 1949-1960. The Frank Lloyd Wright Building opened in Oct 1959, so these paintings (and a few sculptures) were very early acquisitions for the museum. Many artists that were represented are well known, i.e. Pollock, DeKooning, Rauschenberg. 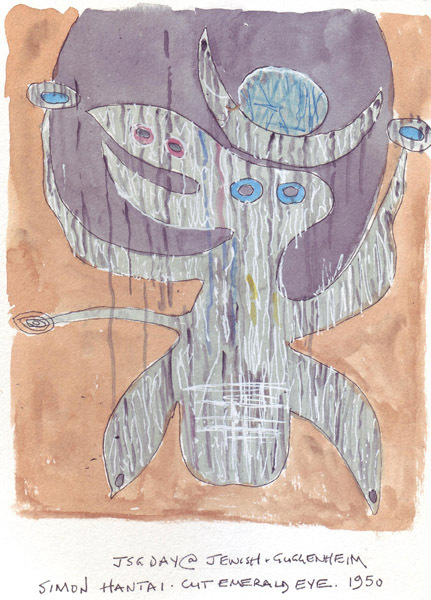 But many of the artists were completely unknown to me, i.e. Conrad Marca-Relli, who did wonderful canvas on canvas collages, and Simon Hantai, who may have had the only representational painting in the exhibit, even though it is an imaginary creature. My challenge copying this painting was using watercolor and pen to create something that was painted in oil. It was fun to be back in NYC with friends who also enjoy museum-hopping. Tomorrow will be the American Museum of Natural History with my 5 year old grandson Callum. I'll have to take a few minutes to draw some animals! This will be the last blog post about our recent trip to Venice. The other 8 sketchbook pages were done at restaurant tables, on airplanes etc., and could have been done anywhere, meaning there is little that would make you think of Venice when you see them. I love seeing the very elaborate masks in the best Mask Shops. And I needed to paint one of them in my sketchbook to remember them. 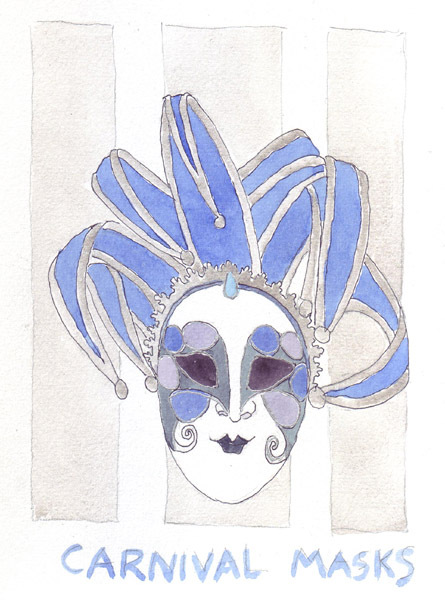 The gray color on the mask and background is Winsor-Newton silver gouache. I squeeze out a little, let it dry with my watercolor paints in my palette, and rewet it when I want to use it. I also used gold gouache while we were traveling. 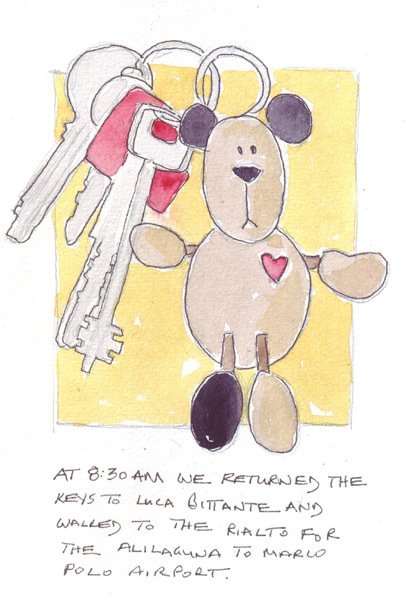 This was our set of apartment keys for the week. Our friends who shared the apartment had a similar set. The apartment owner met us early on our final day, to check us out, and direct us to the Alilaguna boat back to the airport. I was really sad to leave this apartment in a 16th C. Venetian palazzo. It really felt like our home for one week. 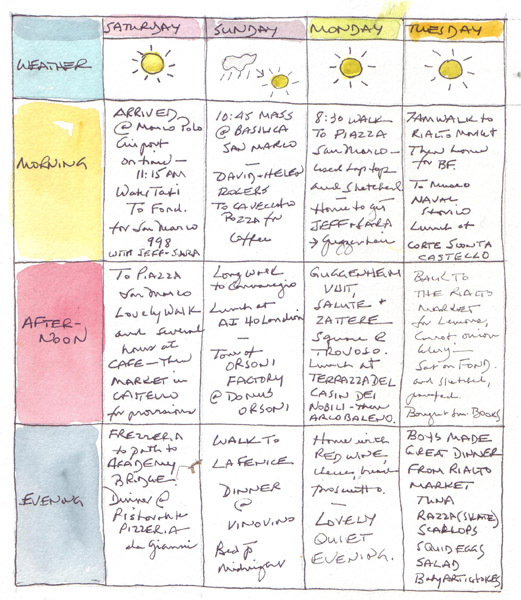 I created a grid for for daily notes before we left New York, and filled in the highlights of each day so I could remember our visit. 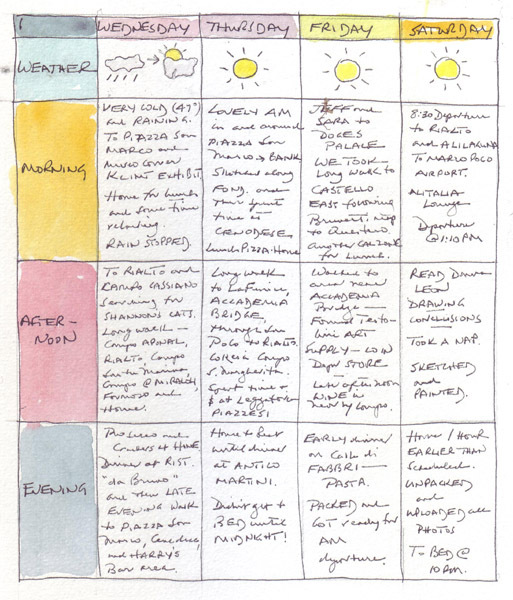 The Weather, Morning, Afternoon, and Evening notes were usually written right before bed or when I woke up the following morning. I almost always put a layout like this in my travel sketchbooks before I leave home and include it here just to demonstrate the technique. I'm sure that my writing is not readable.